Acquired from the above by Dr Georg and Josi Guggenheim in April 1955. Zurich, Kunstgewerbemuseum, Der Sturm. Dokumente, Graphik, Bilder, Plastiken. Otto Nebel. Bilder, farbige Blätter, Zeichnungen, Mosaiken, 1955. This painting is included in the Alexej von Jawlensky archive and will be included in the forthcoming catalogue raisonné. Infused with delicate colour and an absorbing visual rhythm, the present work, painted circa 1918-1919, is an engaging example of Jawlensky's series of works referred to as the Variations. The name of this series was a deliberate reference to the musical inspiration that lay behind them. 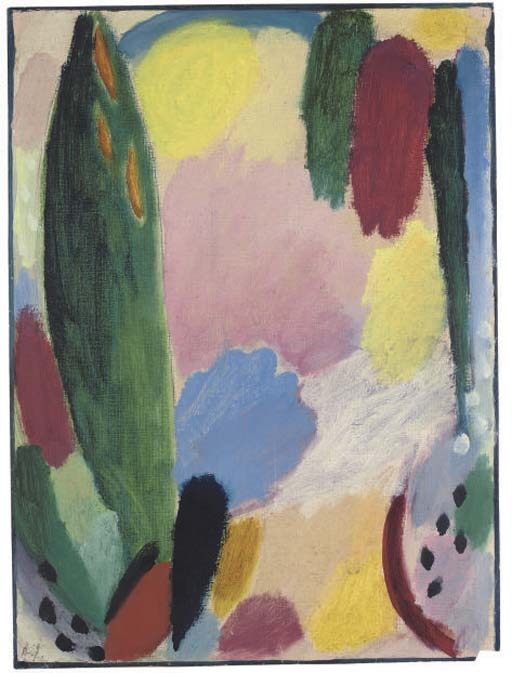 This was to be the first theme that Jawlensky would explore in a series, a system of depiction that would define his oeuvre for the rest of his life. Variation conveys a powerful sense of emptiness and solitude, a pictorial representation of Jawlensky's state of mind at the time of its execution. 'It was very tiny, our house, and I had no room of my own, only a window which I could call mine. But I was so gloomy and unhappy in my soul after all those dreadful experiences that I was quite content just to sit at the window and quietly collect my thoughts and feelings... In the beginning at Saint-Prex I tried to continue painting as I had in Munich, but something inside me would not allow me to go on with those colourful, powerful, sensual works. I realized that my soul had undergone a change as a result of so much suffering and that I had therefore to discover different forms and colours to express what my soul felt. 'I began my so-called 'Variations on a Landscape Theme', which was the view from my window-- a couple of trees, a path, and the sky. I started trying to express through painting what I felt nature prompting me to say. By means of hard work and tremendous concentration I gradually found the right colours and form to express what my spiritual self demanded' (quoted in M. Jawlensky, L. Peroni-Jawlensky and A. Jawlensky, Alexej von Jawlensky: Catalogue Raisonnée of the Oil Paintings, vol. I, 1890-1914, London, 1991, pp. 25-30).